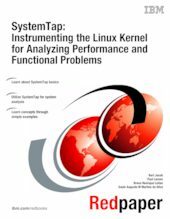 This IBM® Redbooks® paper provides information related to the Linux® -based SystemTap tool. This tool can be used by developers, analysts and specialists to better understand and analyze Linux systems and applications. Until now, its primary use has been to look into the workings of the Linux kernel and various system calls. Its function is expanding to provide information related to user space as well, but that will not be the focus of this paper. This paper describes the basic mechanisms used by SystemTap to gather data and offers guidance on getting started using the tool. Using examples, we show how to use the tool to capture and present useful information that may not be readily available by the myriad of other tools generally available on the Linux platform. Though our examples are relatively simple, they provide the basics to build on to develop more robust scripts that meet the reader’s specific needs. The reader will appreciate the power and simple elegance of SystemTap and how it can be used to help analyze Linux systems to identify functional and performance-related problems, which in turn can help ensure that system and application design will minimize the chances for problems in the future. This paper is intended for individuals who have programming experience and familiarity with Linux and existing system facilities.